Bed bugs: Do mattress encasements help? ⦁ Mattress encasements can help reassure customers traumatized by a bed bug infestation. ⦁ Mattress encasements can help techs easily identify new activity. In bed bug management, half the battle is helping to establish appropriate expectations for all the different products, methods and techniques. We regularly get calls from consumers who want encasements to help prevent a bed bug infestation because they read a post on the internet or saw a picture in a magazine. While encasements are a valuable tool, they may not be able to deliver all that consumers expect of them. They are designed for two purposes: to prevent bed bugs from entering or escaping, and to prevent bed bugs from feeding through the fabric. Prevent an infestation outside an encasement. A bed bug infestation occurs when a gravid female bed bug or a mated pair can find a safe harborage and a regular meal. 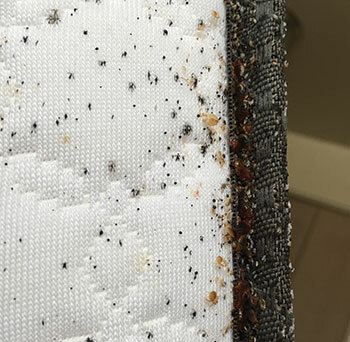 While mattresses and foundations (bedding people call them foundations now, not box springs) are common places for bed bugs to harbor, they can harbor on bed frames, headboards, nightstands or even on encasements. Encasing mattresses affects only the bed bugs trapped inside. Eliminate an existing infestation outside an encasement. Encasements can contain bed bugs inside, where they will eventually starve to death, but bed bugs outside the encasement will continue to thrive. Control efforts must be made in conjunction with the encasement to end an infestation. Arguably, a small population on a mattress with no scattered individuals could conceivably be entombed in an encasement and effectively eliminate the infestation, but this is likely to be so rare as to be unworthy of the discussion. For infestations that small, even modest control efforts with vacuums and/or insecticides could easily achieve the same results. Provide peace of mind. Encasements can prevent bed bugs inside the encasement from feeding on people outside the encasement. As part of a larger control effort, this can add a measure confidence when the mattress and foundations have harbored bed bugs. This is especially true when the mattress will not be treated with a residual insecticide. It often gives the customer peace of mind to know that the mattress is safe to sleep on. Facilitate inspection efforts. It is also much easier to inspect an encased mattress for new activity. They have no piping around the edges and no buttons or tags, so bed bugs are forced to stay where they are easily seen. Droppings show readily on the clean fabric surface. Continuing activity can be unmistakable, even when the population had been well established. Protect beds. Finally, encasements can protect new mattresses and foundations from being infested with future bed bugs. For residents who have been through the ordeal of bed bugs, this can mean great peace of mind and may be worth the price of admission. As with any other tool, they are best put to the purpose for which they were intended. Contributor Mark Sheperdigian, BCE, can be reached at sheperdigian@rosepest.com.